Welcome back to another Spotlight Challenge here at Crafty Cardmakers and for the next 2 weeks we are looking at an ORIENTAL theme. 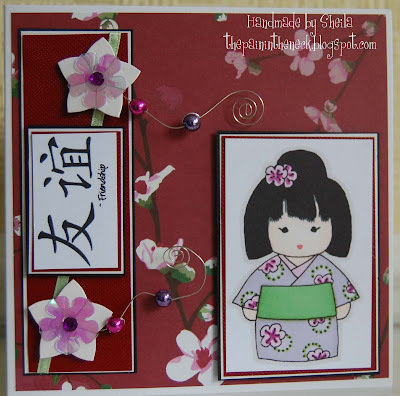 There are so many styles of Oriental around to suit every taste from cutsie to classy so come and have a go at this style. As always the challenge will run for 2 weeks alongside the regular challenge which is currently AROUND THE WORLD so you can enter into both as that one is open until 4th Oct. The prize for this challenge is an Oriental cardmaking kit from The Stampman as shown above. I have used an unmounted stamp which I've had for years and have long forgotten from whence it came! 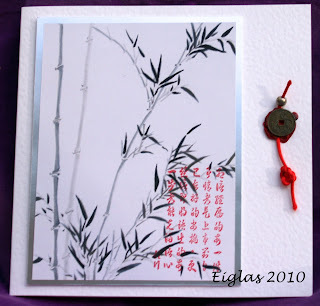 I started by using two colours of Distress inks on my card then stamped the image in black Versafine, I used a post-it note to mask the image and stamped the bamboo to frame the left side of the image and while the mask was still in place I spritzed on some green Altered Originals ink. The backing is some handmade oriental paper which I've had kicking around for a long time and I used some Mizuhiki cords to tie a knot which the instructions called Felicitatieknoop (not sure which language the instructions are in - just as well there were diagrams!). The greeting translates as Love. Isn't she so cute, I love this image from Mo Manning. 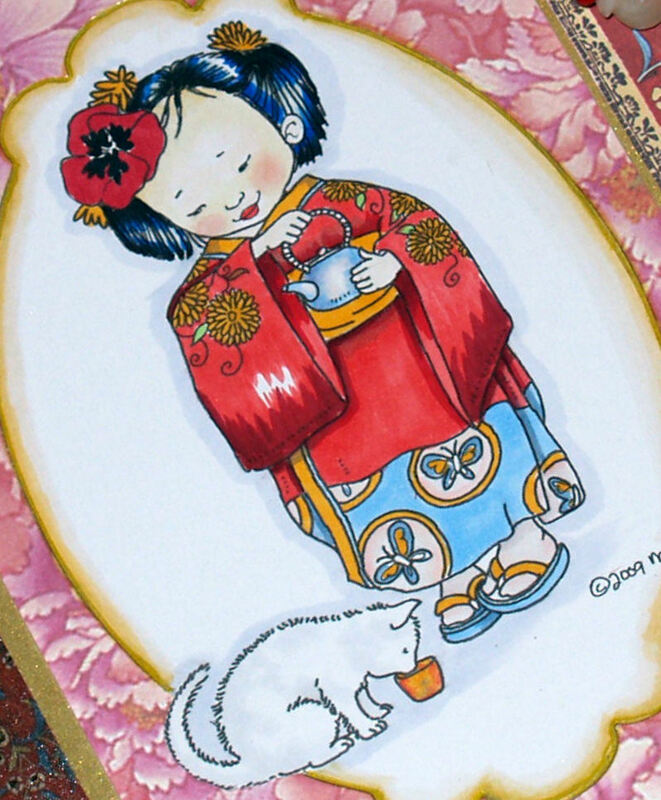 She is colored with Copics in a monochromatic theme. 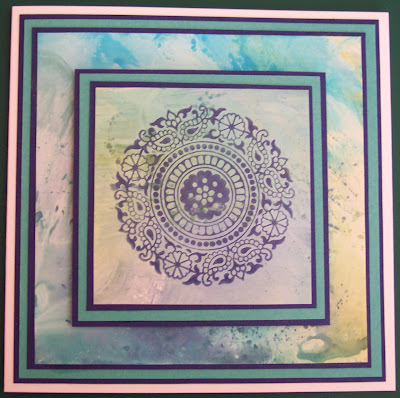 Background dark purple, I cut a circle out and then embossed with CB swiss dots. Next I put a square of purple floral under the circle. I then cut out a strip and cut scallops in it with a PTI border die, and stamped with a script in white and added ribbon. All done. 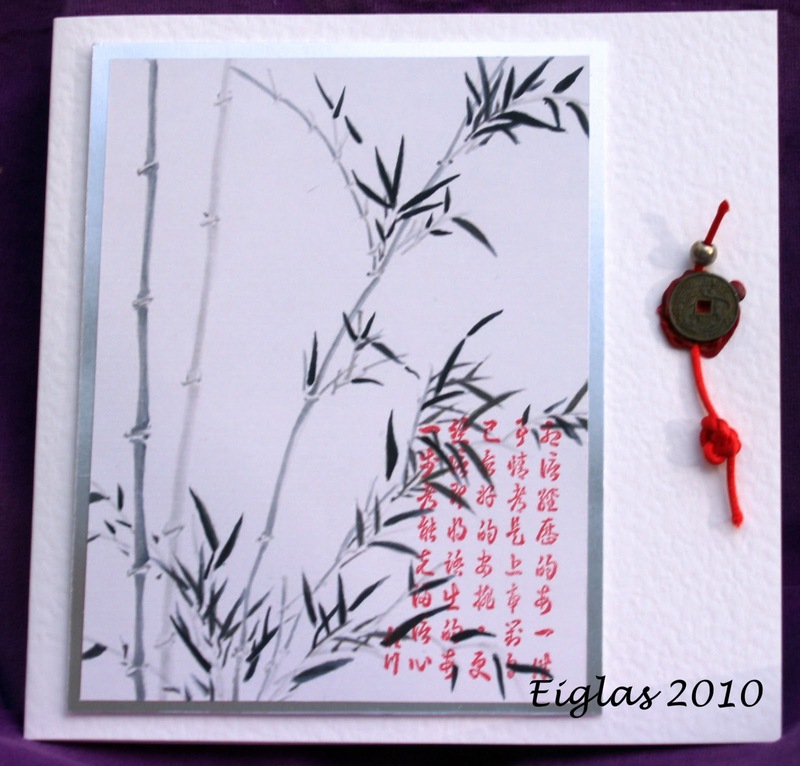 I'd love to take the credit, but the piccie of bamboo was copied from an old picture I have had for years using my grey Copics onto Ryman's coated card. 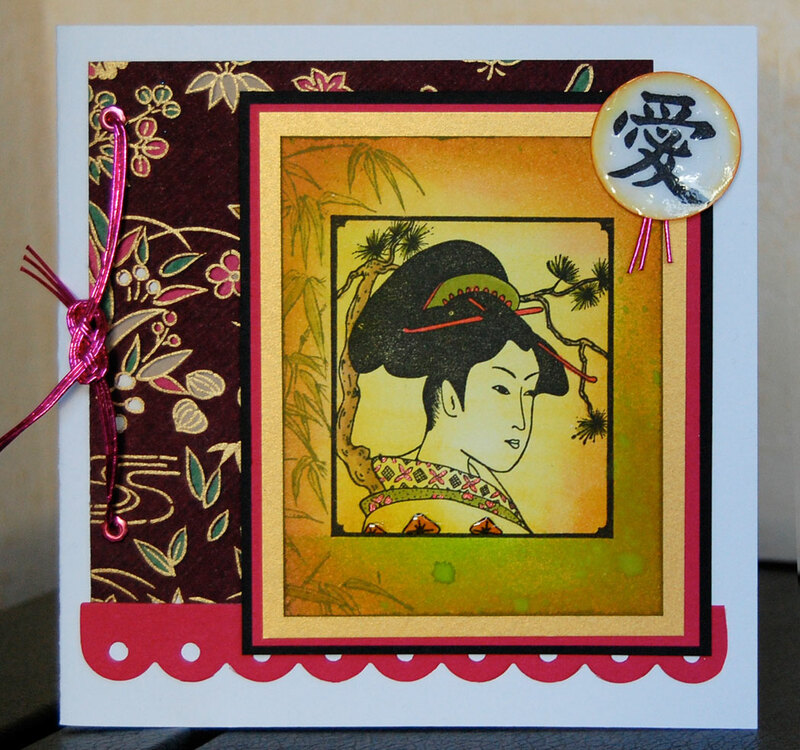 The oriental writing was stamped with Brilliance Rocket Red over the painted image. This was mounted onto silver foil board and then with 3d foam onto hammered white cardstock. The knotted cord is held in place with red sealing wax and an oriental coin. 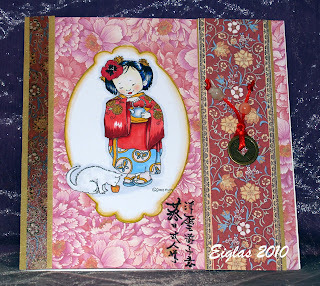 I used an image from Joanna Sheen's Eastern Treasures cd. 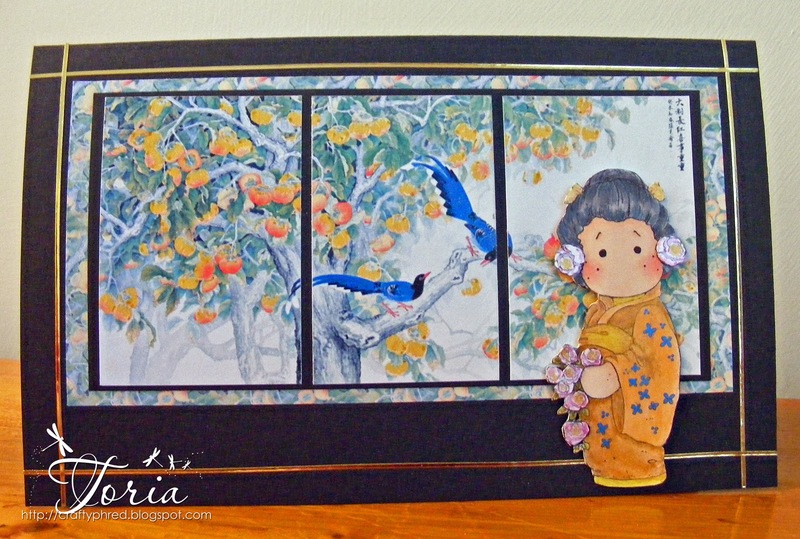 I used gold and Blue Spica Pens to add detail to the fruit and birds. I cut the image into three panels and then mounted them onto black card. This I mounted onto matching paper from the cd. I stamped Japanese Tilda with Memento Black Ink. I coloured her skin with copics and her hair with black soot distress ink. I used a combination of mica paint and distress inks to colour her clothes. I used distress inks and mica paint on the flowers and leaves. I created a black card and edge this with gold peel offs. Then mounted everything onto this. I used a stamp which was a Secret Santa gift a couple of years ago, stamped with Memento ink and coloured with Promarkers. I stamped the image a second time, and removed the main image, leaving the frame and flowers only, and mounted thiat on the main image with sticky pads. I embossed some red mirri-board in my Wizard with a Papermania embossing folder, and finished the card with a green swirl, some Wild Orchid Crafts flowers and one I made with crepe paper. 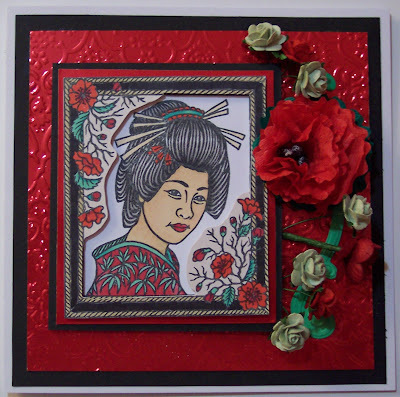 Our new spotlight on oriental designs starts today at 12 noon and our challenge Around the world still runs until 4th October so we'd love to see your designs for them! 55 - Val! Oooh and what a beautiful design too! Also please email me your details to forward to Joanna, well Done! Well I've gnashed my teeth on how to use the clipped add on and it refuses point blank to work on my pc so doing it the regular way! As we dont have a Top 3 for the spotlight challenges we are going to spotlight some of the entrants here. Spotlight challenges run every 2 weeks for 2 weeks and look at a technique, product or style more in depth, our current one open till 9am Monday is Alcohol Inks. 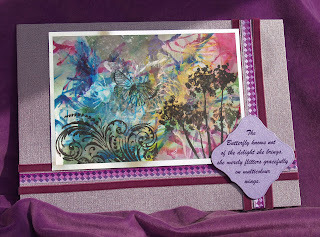 Here are two lovely entries for the challenge from Chrissie and Sarah both using different techniques. ﻿Still a little bit of time left to play HERE if you want to have a go at them! Good Afternoon everyone and welcome back for another challenge! Thank You for your awesome clean and simple cards, you really love that one and so did we! If you havent received a comment yet fear not as we will get round you all. Winners will be announced this week for CAS and the 2 spotlights. If you look over to the right we are installing our team badges. None of us like the trend of putting our mugshots on the sidebar, we don't want to scare you after all so this is our version of it based on our personalities - You might want to ask Corry and Kat round as they're clean freaks lol! 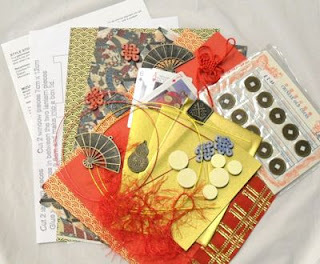 As its coming up to World Cardmaking Day we're having an Around the World challenge. Think African, French, British, Oriental, Stars & Stripes, Polar Bears etc but please note your design MUST BE EASILY IDENTIFIABLE AS RELATING TO A COUNTRY/CONTINENT. If in doubt please leave us a note. We are sponsored today by The Stampman who have sooo many goodies in their store so please go check them out if you've not been before. 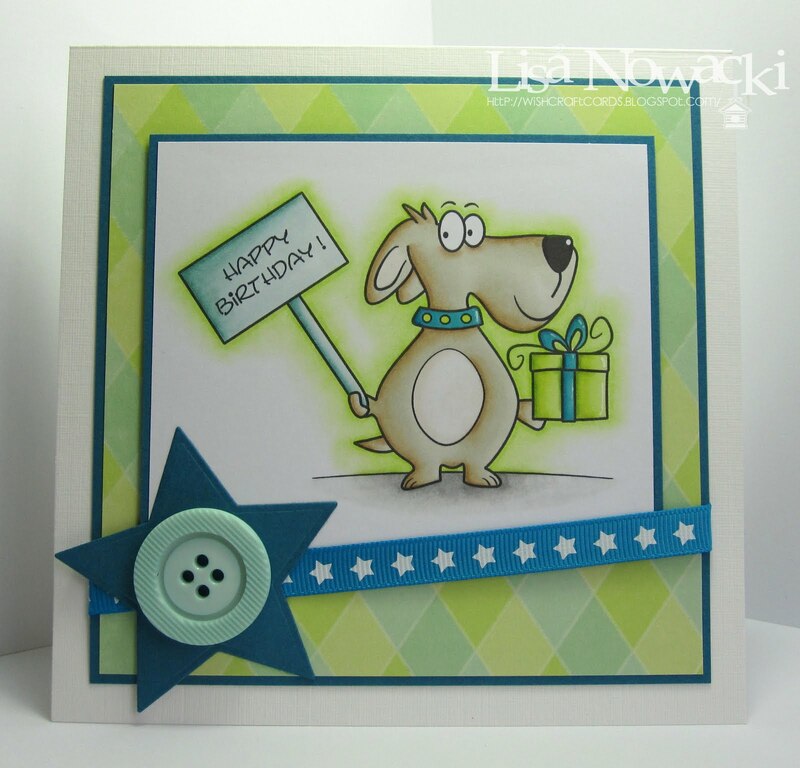 They have a huge range of stamps including their own Aspects of Design, yummy moonglow products which are two toned, lots of ranger and Sir Tim products and much much more! The Stampman are offering a £10 voucher for the winner so get your thinking caps on! 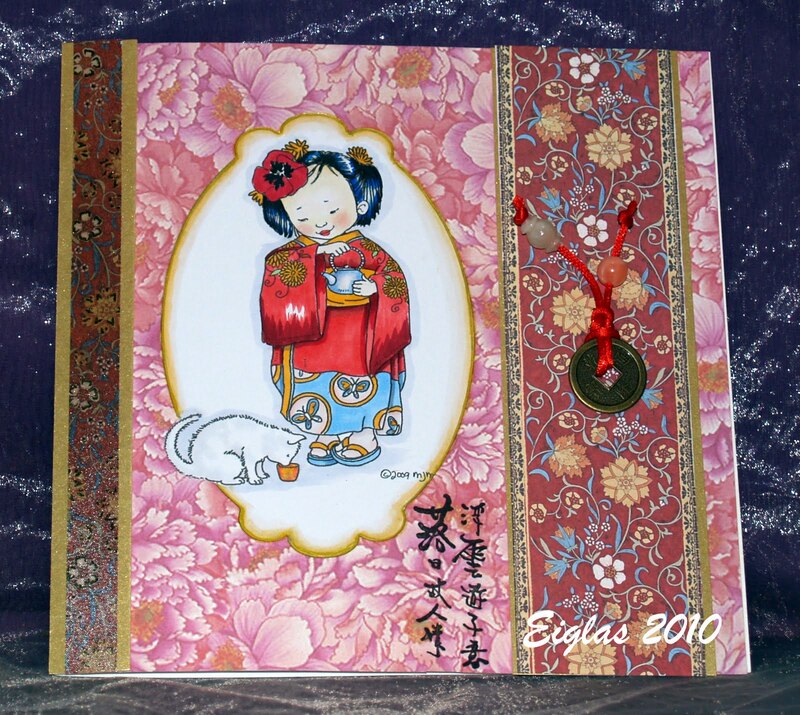 I have chosen the Far East for this Challenge, and, using a 5 x 5 card blank, coloured my image with Promarkers and matted and layered some lovely oriental-looking papers; attached a narrow ribbon; added the Chinese sign for 'Friendship' and added 2 lovely embellishments. I used Hamish in Kilt from Sugar Nellies and paper-pieced his kilt in the same tartan Kanban card as the background and his jumper and sporran using scraps of green and brown. The rest of the image is coloured with Promarkers. 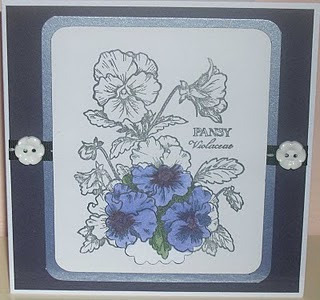 The blue card behind the image has been embossed with the Cuttlebug Swiss Dots folder. It's a male card so I've just finished off with some buttons. For my demo for this week, I've chosen an image from one of my very favourite artists, Mo Manning, which I've coloured with my trusty Copics. I've no clue what the the oriental writing says (if anyone can read it please elucidate!) as the stamp set didn't come with a translation and I apologize for any offence if it's not the right way up! The backing papers and ribbon are from stash but I think they were originally from Readicraft. Well, I'm off to Venice for this challenge (been twice before, lol). I used a stamp from Darkroom Door and coloured it with Derwent Inktense pencils, blending them with a damp paint brush. 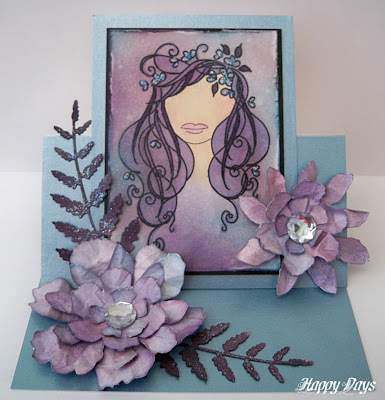 The bg paper is from the Crafty Individuals Travels in Italy pad and I added Prima crystals and flourishes cut with the Sizzix Decorative Flourishes die. I have to be honest - Venice isn't really this colour. It's more terracota and beige. For the Around the World theme I have chosen Africa. I made a DL size dark brown card and cut a leopard print paper smaller to show a border. 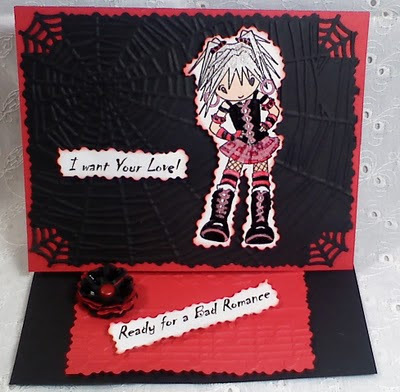 I have used some rubber stamp images I have had from a swap a few years ago and coloured in with Promarkers. I wrapped funky fibres around the card and threaded with beads to match the paper which I have had in my stash for a good few years. For our Around the World Challenge, I have chosen to highlight India with my East Indian Tilda. 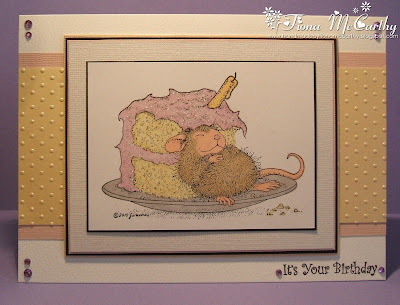 When I saw this stamp, I just HAD to have her.....I explain why on my blog. I paper pieced her Sari & showered her with flowers including the embossing. Did you know the flower of India is the Lotus? This is what I tried to portray with the yellow flower creation in the bottom left corner (even though the lotus is primarily purpily/pink). I love my Indian Tilda! I hope you do too . 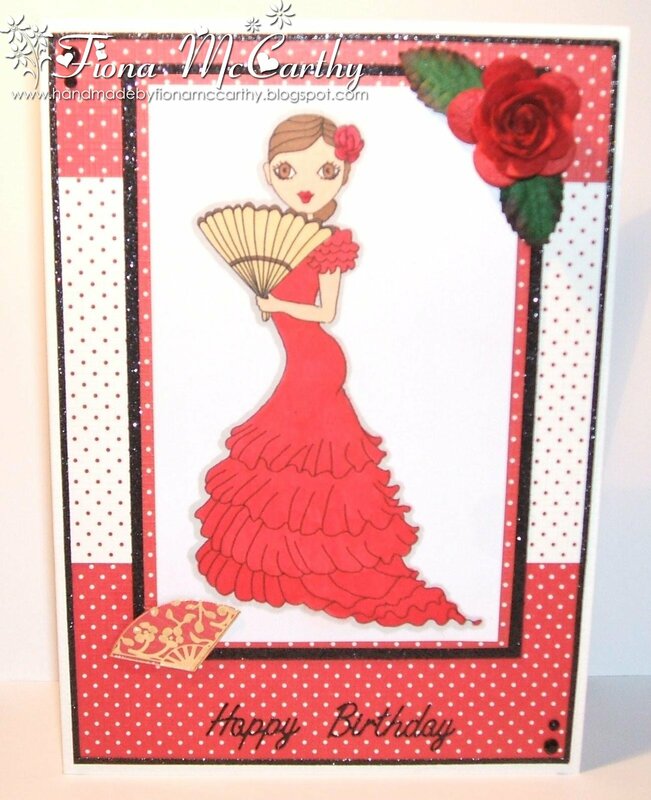 For my Around the World card, I chose Spain. 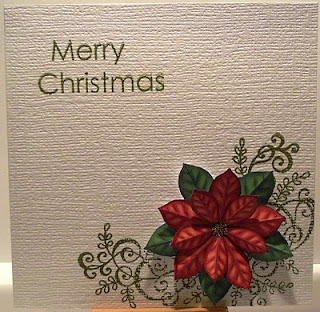 This image is a digi stamp called "holly in spain" from Charmed Cards and Crafts.My papers are actually from the Forever Friends gift wrapped christmas range but I think they work well as its hard to find Spanish looking papers lol The rose and leaves are from Wild Orchid and the gems and peel offs are from my stash. I chose Africa for my Around the World card. All of the bps are handmade papers which I have had in a secret stash forever! The stamps were from Frantic Stamper in the US. I coloured the background before stamping with a Big N Juicy Spice inkpad, sponging random colours mostly from the orangey section until I had covered the card. Before it had a chance to dry I spritzed on some Touch Of Mica in Gold all over the top. Sadly, the photo is not picking up the shimmer. The word Safari was cut out with a Sizzix alphabet from the same paper behind the image, and I liked the way bits of the gold pattern appeared on the letters making them look almost tribal. Wow you sure love your bling bling!! Thank You for your fab entries to the glitter and sparkle challenge, winner to be announced in the week! We will also be spotlighting entries to the spotlight challenges at random times so check back between challenges to see if we're spotlighting you! Onto our new challenge which this fortnight is ALCOHOL INKS. Oh yes, those things you probably bought at a show and consigned to the cupboard well its time to Free them!!! The team have come up with various ways of using them aside from the doofer tool thingy lol! They can decorate numerous items including metal and wood so give them a whirl! BTW they don't have to be Ranger branded, Pinata is fine too! Over to the team and their inspiring creations, thanks girls! I had these plain tins which were a bit boring, and I decided to zhuzh them up a bit with alcohol inks. After some playing I realised that rather than dabbing the applicator onto the tin it was best to let the inks do their own thing. But as the tin was ever so slightly textured they kept stopping. Eventually I discovered if I wiped the tins down with the blending solution first and, before it was dry dripped on the inks, it gave a much nicer effect. I turned the tin into a jewellery gift box with some recyled packaging tissue paper. I then used some old Nestability packaging and cut out a Go Kreate die shape from the packaging and did the same with that. I matted it onto plain lemon cardstock and added an acetate butterfly to finish it off. I used the alcohol inks on memory glass (why is it called memory glass - anyone know?) and stamped my owls on top using Jet Black Archival Ink. I attached the glass to white card using Glossy Accents then layered the white onto green card, the little gems are hiding the spots left by the Glossy Accents! I then cut a strip of the green card and punched a border with a Stampin Up punch and layered some ribbon on top. 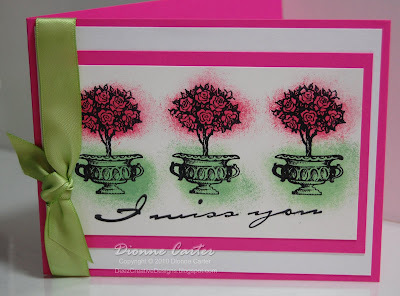 The backing paper is Bloom & Grow by MME and the little sentiment is from Studio G.
Clean and simple AND alcohol inks - simples! 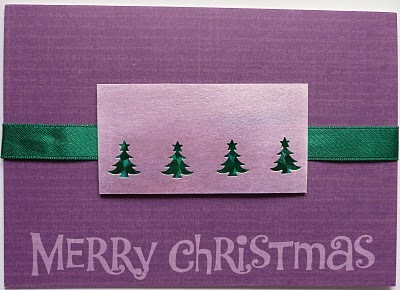 I stamped the sentiment (from Hero Arts Anytime Messages) directly onto a white card blank and added a bit of ribbon. Then I coloured some glossy paper with Shell Pink and Red Pepper Alcohol Inks, stamped the butterfly (Clear Choice 20 Best Friends stamps) in Black Onyx Versafine and clear embossed. Cut it out and popped it on the top. 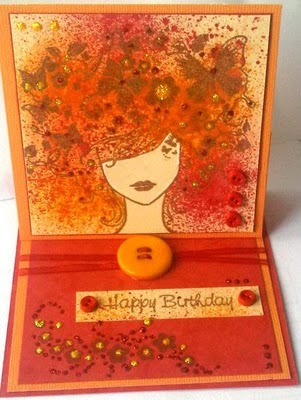 I added two colours of Alcohol inks (Citrus and Pool) to the felt on an applicator, keeping them far enough apart that they didn't bleed into each other, then dragged the applicator across a piece of glossy card to create a duo coloured stripe. 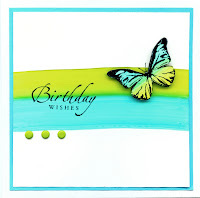 Stamped the Greeting (SU) and the butterfly (ISC) with Memories Black ink, then embossed them with clear powder while still wet. Coloured another piece of glossy card with the same alcohol inks, then stamped and embossed the butterfly again; cut it out and attached it over the top of the original one, using double sided foam tape, revealing antennae underneath it. 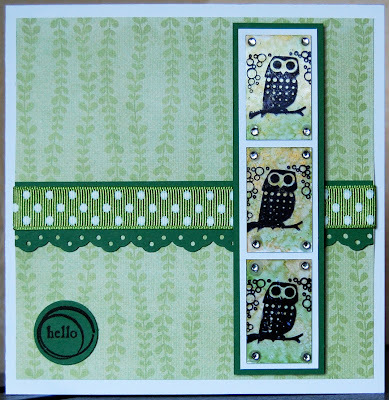 Added three citrus brads under stripe to balance the design, then layered onto turquoise card and white card. I used Claudine Hellmuth sticky back canvas and dropped blending solution on a piece then some cool peri alcohol inks which spread making shades of purples and pinks. I've also smudged patches of a metallic gold reinker on for some glam. 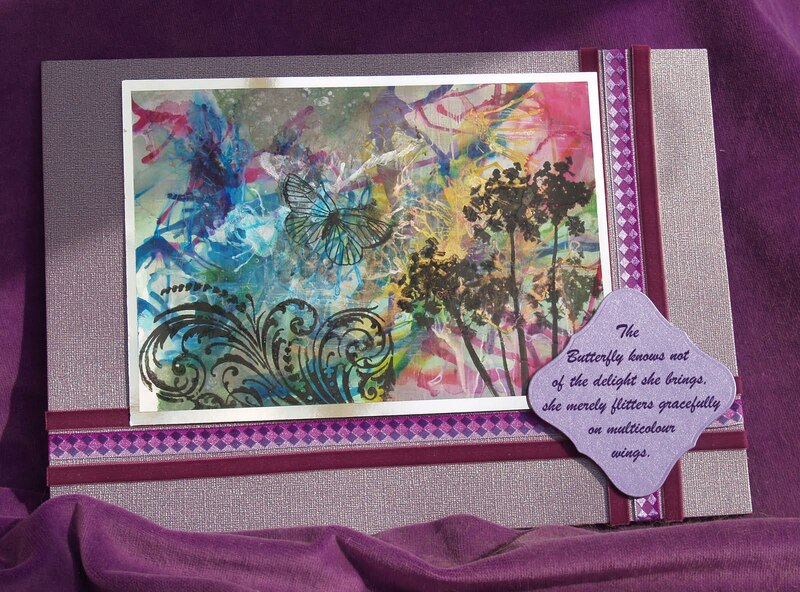 I've used more alcohol inks (pink sherbet & cool peri) on glossy card and ran through the cuttlebug and stamped sentiment on a blue & purple piece. I used a white gloss cardstock ( Astrolux) and Ranger Alochol inks from the Rainbow collection. Using a non-stick worksheet to protect my worktop, I dropped very small puddles of different inks and a light smattering of blending solution onto the card, then blew it around through a straw. When is was mostly dry, I placed an absorbent paper on top and blotted it then 'polished' it with kitchen roll. 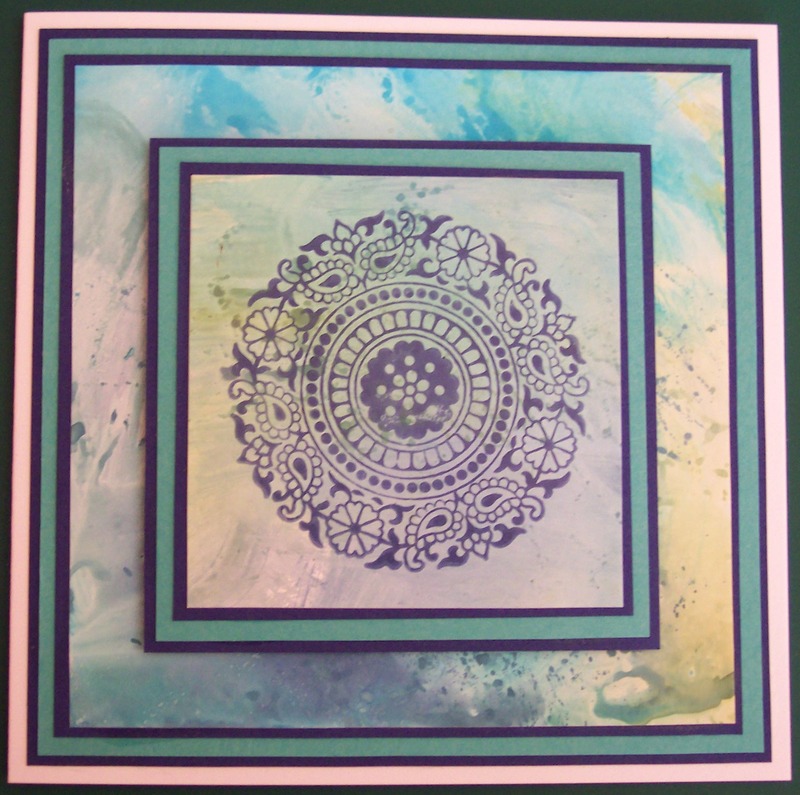 I then stamped on it with Versafine black and the three different stamps you see. I then heat-set it and mounted it on silver and Bazzil with two different types of ribbon to finish off. The verse is mine - you're welcome to use it! Good afternoon all! Thank You for you entries to our video challenge of Lady Gaga, the winners have been announced below this post! 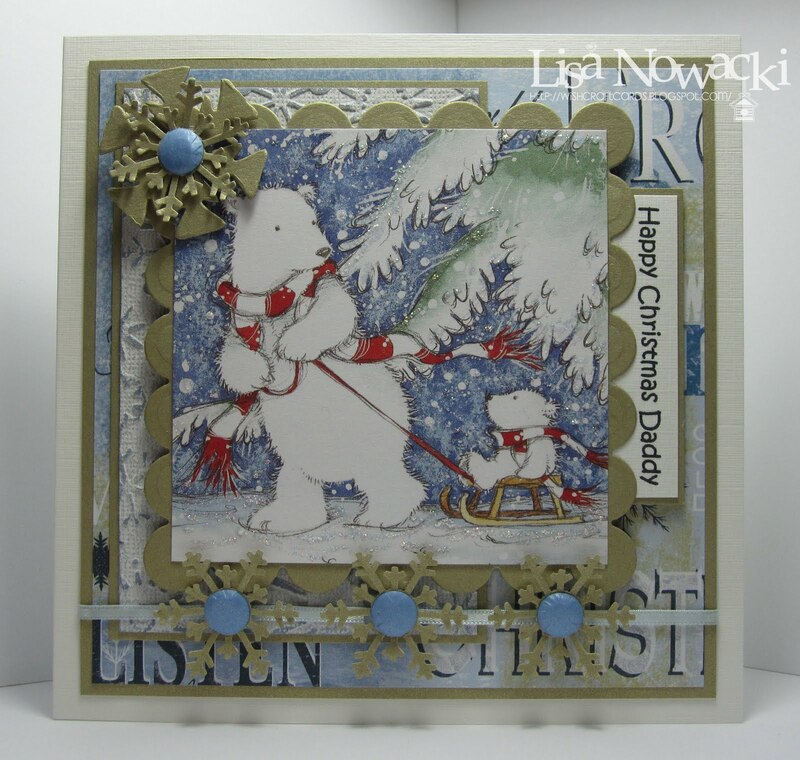 See inspiration can come from a huge amount of sources so if your mojo takes a hike especially with the onslaught of the xmas card season then flick on some videos and you'll soon have your head buzzing with ideas! Thank You so much to Susie Sugar at Die Cut Dreams for sponsoring the challenge and for guesting with Vicki Garrett. Our spotlight on glitter & sparkles is still open for another week too if you also want to play that! Time to put all those flowers and frills away for this one and keep it clean and simple! The team have aced this one don't you think? I think they've done superb and seemed to have enjoyed the challenge so hope you do too! Just a note about the challenges in general as its really got to be said - Please keep to the theme of the challenge set. I know most of us do try to find challenges that fit with the card you've made but some entries are being far too way off the mark. Teams put time and effort into devising challenges and making samples to inspire so please play fair and check whether it is really meeting the criteria. If we feel your entry is too far off the mark from the challenge set we will remove your entry as it is unfair to the participants who do and team members who visit. We are sponsored again by our regular monthly sponsor Joanna Sheen - Check out her new Christmas Grotto with a huge range of products especially for the xmas crafting season and awww how cute is Popcorn bear in his santa suit! Joanna is sponsoring us with a £10 voucher prize for the winner so get your thinking caps on and keep it clean and simples! Here's what the team have come up with to inspire you, please leave them some loves! This is a simple black peel-off mounted onto a sheet of paper from the Basic Grey Indian Summer collection. 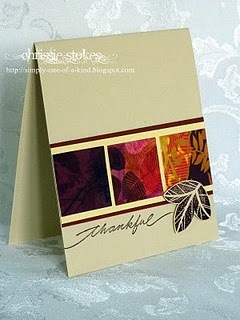 The sentiment is a rub-on from Kaisercraft. Truly a challenge for me. This took more time thinking then making. 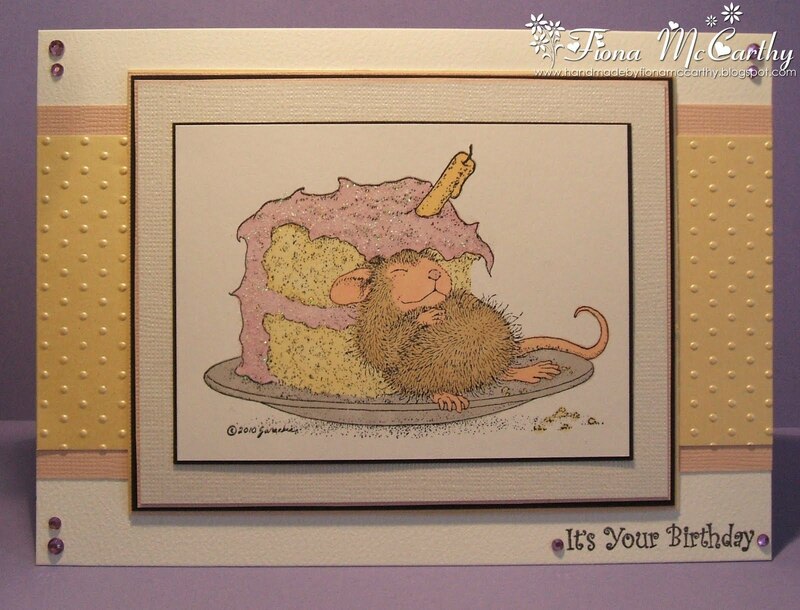 I stamped the image 3 times and sponged the color on, and added a sentiment. A few mattes and a ribbon and I'm done. Clean and simple makes me think pastels. 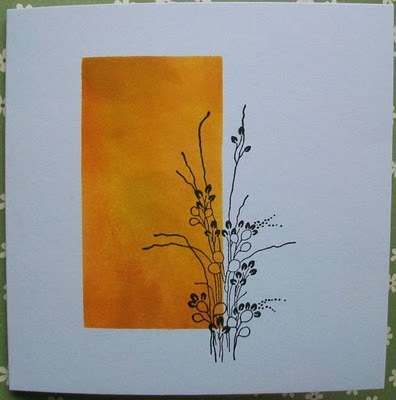 I started with a square off white card used dotty paper from a new paperstack, yellow and white and blue and white with white card layered inbetween. I stamped the image and coloured the cutie little girls with promakers. I added a little blue ribbon on the corners with pink glittered flowers (don't look very pink in the picture mind !!). A few gems to finish it off. I think this lovely stamp from Hero Arts fits the theme of Clean and Simple quite well. 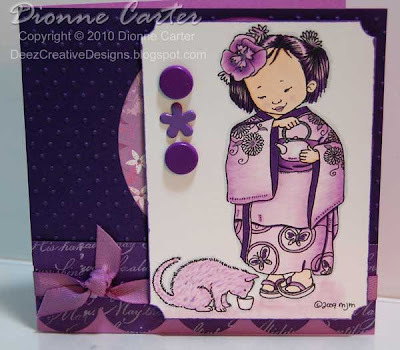 I stamped straight onto the card and then stamped again on patterned paper. I cut out the flowers and 3D'd them for a bit of dimension. The stalks are coloured with pencil. 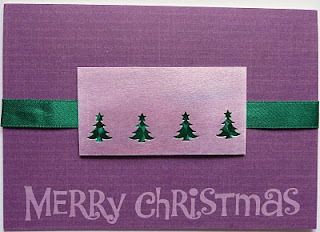 A strip of the same DP with a pretty edge using a Martha Stewart punch and a piece of ribbon finishes the card. I was a bit stumped when it came to clean and simple, I love using all my fab delish papers! But after some blog hopping and great inspiration I knew how to get the challenge done! 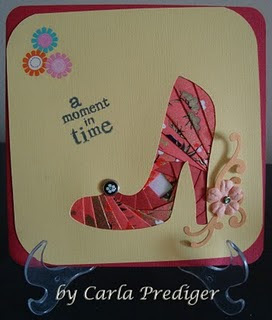 I used some basic kraft card stock layered a panel of Prima "Jack'n'Jill" papers with some gemstone card. Added a die-cut butterfly from both papers, some more buttons from my Granny's button box, some ribbon, gems and a sentiment to finish! I chose the colors black & white. Started with a white cardstock base & layered black cardstock on top then added some faux stitching. 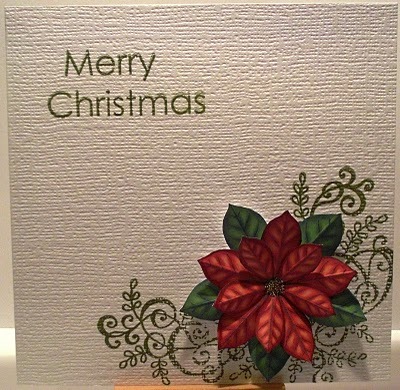 Then I layered a piece of embossed white cardstock & added a ribbon with a knot. I used my inverted scallop square nestability to add a shape behind my sentiment, which I picked up as a freebie from Sentimental Sundays (new free sentiments to be had each Sunday at their challenge blog). I then used my tag punch to cut a tag out of some 100% cotton designed paper, to which I added an eyelet and another ribbon. Voila. 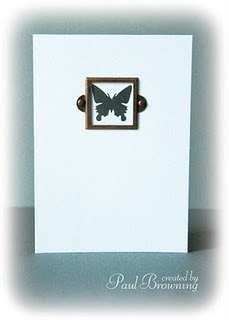 Clean & Simple really is a challenge for me as frequently I find it difficult to know when to stop adding to a card. 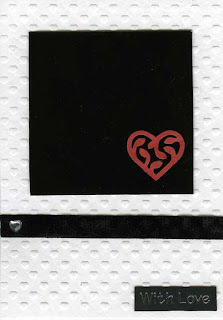 I stuck to a colour palette I love of Black and White and added the Martha Stewart punched heart for a spot of colour. 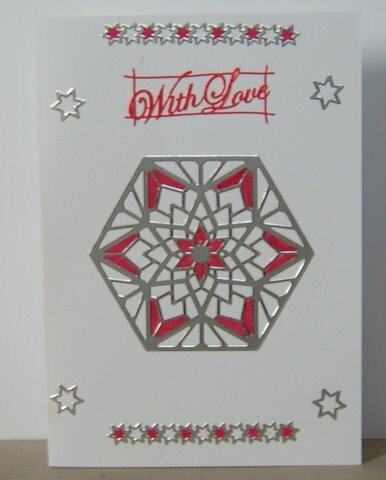 The base of the card is embossed with small hearts and the ribbon is velvet for more texture. I added a small diamante heart and a sentiment to finish. I blame Lisa entirely! I saw her cute Lili of the valley bear in the glitter & sparkles challenge and I had to get one (or two!) Made very simply, stamped and coloured with promarkers and added sakura stardust clear on the tinsel, added stickles stardust around the edge and sakura glaze pen to the baubles and mounted on some gold and white card. I decided to try something different this time and use our craft robo. I saw this lovely silouette and knew that it would be great for this challenge. I decided to use a very simple colour theme of black and white. I felt this would really show off the silouette and would hark back to bygone days. 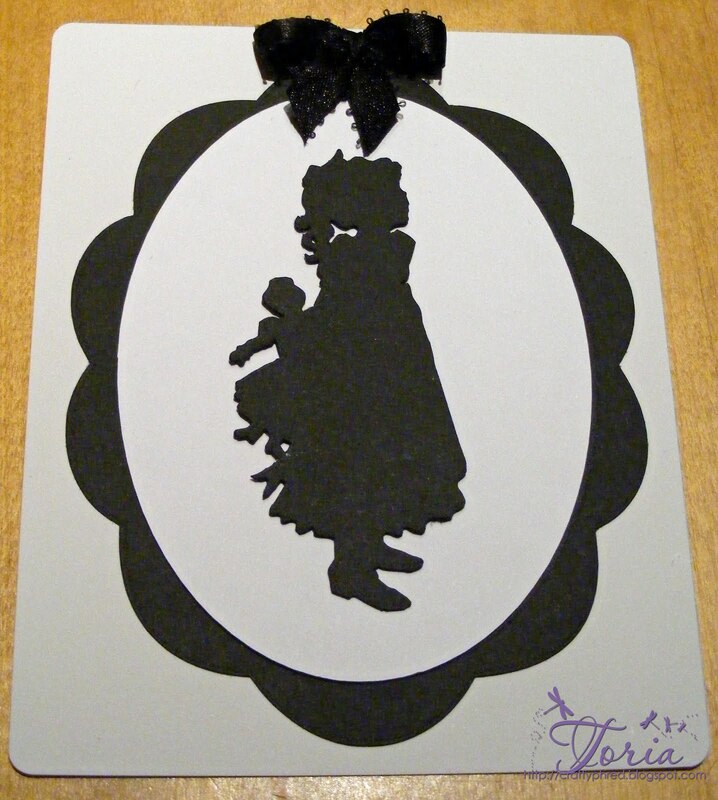 The oval and scalloped oval are with free cutting files, that I got from Penny Duncan Creations and the silhouette of the girl I bought. 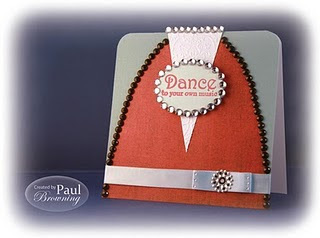 I layered the the ovals on to a white card blank which I rounded off the corners and added a bow to the top. First up are the winners from our Birthday challenge (Challenge 27) who have been chosen by Mr Froggy and the Top 5 by teamie Melly. Well Done Stacey! Please email me your deets to claim your prize. 16 - Cockney Blonde! Well Done Alison, please email me to claim your prize! 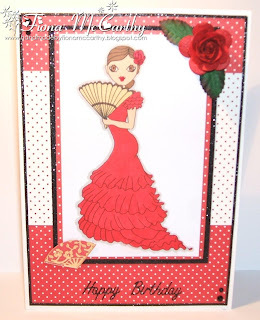 Just a note that we don't have a Top 5 for the spotlight challenges as they are designed to play and have a go at new techniques or styles but the team have decided from the next spotlight challenge we will be spotlighting some of you so your card may find its way onto this blog! 19 - Sue (Scoopys Stuff) Well Done Sue! Please email me your details to pass onto Susie.